Easter weekend, on a bright Saturday morning, I sat poolside studying Julia and her friend I’ll call T, taking their weekly swim lesson. With Passover and Easter falling over the same weekend, the poolroom was still and empty, except for Mr. T’s mom and me‑‑ and our kids. Coach D with some of his other students. Julia is the furthest from camera, at the end. Mr. T. wasn’t into jumping into the pool, even at 4 feet. Coming in around 3 ½ feet, or so he probably didn’t think it was such a great idea. Additionally, bodies of water appear deep no matter where you stand, at least to me. And possibly him. But Coach wasn’t having it. “Do you mind if I give him a little assistance,” Coach D said to the boy’s mom. “Sure, go ahead,” she said. Then Coach called out, “I need some help out here.” His assistant, a lean tan, twenty-something Latino man sporting swimming trunks, peeked out from the office door, beyond the far end of the pool. “Can you come here, please?” Coach asked. The man moved forward, towards T and Julia with a slowed kind of walk that didn’t suit him. Far too tentative and measured to be his norm. He rolled to a slow stop and stood beside the boy. “Toss him in,” Coach D said. “You sure?” his assistant asked. “Okay with you, Mom?” Coach asked again. Then Julia’s kid alarm bells activated, no doubt brought on by the boy’s large, round eyes that now leaked tears that streaked his face. “C’mon you can do it, just like this,” Julia said and raised her thin brown arms up into a mock diving move. But still the boy clung to the edge of the tile anchored by his toes and his fears. Now Mr. T’s mom and I began to cheer him on using the typical “ You can do it!” and a few “It’ll be fun, c’mon!” thrown in, to no avail. Coach D stood in the waist-high water, alone, waiting. “Do you think I would ask you to do something that would hurt you? he asked the boy. The boy shook his head from side to side. Then a sob escaped from his throat. And a lump formed in mine. “Then come on, jump,” Coach said. And still the boy did not move. “Okay, Mike do it,” Coach D said. And with that the boy flew through the air like a fallen bird, and crashed through the smooth, blue surface of the water. I thought of all the times I’d been pushed into the brink by life. People have call me brave for adopting a child on my own, for being a single parent. But like Mr. T, I felt the fear, and clung to the edge of the known world, too. How would I be perceived as a single parent? How would I care for this child economically on my own? Then, the social worker called with the notification that Ethiopian might close to single adopters. I spent two days in my apartment, clinging to the edge of the pool. On the third day I called the social worker and said, “I will come in and fill out the paperwork to get started.” It was wide in the air. Then I touched down. My body bobbed and quaked in the chilled water. And then I began to swim. And like Mr. T, once I started swimming. I kept swimming, for three years, until Julia came home. 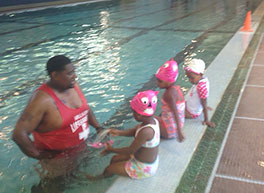 In a way, as a single parent, I still swim quite a bit, however it’s mostly with the tide. And by now having water-soaked skin and damp hair is my new normal. But some days the water holds a North Atlantic frigidity that make me forget that I know how to swim, temporarily. Mr. T splashed towards Coach, slicing the water with smooth toddler stokes, completed his lap then pulled himself free of its grip. Cheers reverberated off the tile walls like symbol crashes at the symphony, delivered by four happy adults and a thrilled little girl. T’s little chest billowed out, proud and round. His eyes shorn bright. It was thrilling to see him, the whole of him, happy and pleased with himself, his feet planted on new ground; a new Eden of accomplishment. He reminded me to look around at where I stand, at my daughter, at our lives and take pleasure and pride in the same. Last week, on the 11th of December, as I struggled with Julia to get her coat on, to leave the house and head out to school the anger rose up in waves like a flocks of birds, circling my stomach. And swooped in again. The battle of the winter coat has been waged since the first chill hit in mid November and reached toxic levels that morning. Into the elevator Julia and I stomped, down eight floors to the lobby, the doors opened but her coat did not go on. So I decided to let Mother Nature help do the convincing. “No I don’t want to she flailed around the cement, kicking and screaming, one sleeve of the pink coat on, the other trailing like a battle worn flag. The doorman and I watched Julia’s performance. Then, after a few minutes, I gather my daughter up. The three of us heading back into the building, back into the warmth, Julia under arm like a slack of laundry. Eventually the coat went on, Julia and I went to school and I went to work but the anger did not subside, did not leave until, the afternoon when I clicked on my Facebook app update at work, discovering that my friend, Peter Saint John, at the age of 43, had taken his last breathe. It was the kind of blow to the gut that it takes weeks even months to recover, to regain faith in the workings of the universe. Peter was a good man. Now a good man no longer walked the earth. Back in September, Peter’s non-Hodgkin’s lymphoma was in remission, a cause for celebration in an Upper West Side eatery, until six or so weeks later, I discovered through Facebook the beast had come back. Later on that evening as I shopped for a dress to wear to an office Christmas party, I slumped past Macy’s on 34th Street, its mile high south facing facade ablaze with a single script word, set in cursive script, three or four stories tall. “Believe,” the warm white letters chided me in honor of the Christmas season. “I had believed,” I whispered and it didn’t work, tears glancing my eyes, channeling the cold. Now I didn’t know what to do with my belief. It took a week just get back to God knows better than I do. “God’s way not my way.” But didn’t make it hurt any less. But the loss did do one thing: made me see the events of that morning didn’t matter. It didn’t matter that Julia reached school on time, or how the day went because I was still having a day, because Julia was still having a day, because we were still alive. We still walked the earth. “Be careful, it’s slippery here,” he said then settled back down on his soiled green blanket. I opened the big-bronzed door of the beautiful church on East 76th Street, and found the pews filled nearly to the brim, at least one hundred strong. Boston Strong someone would later say, a nod to Peter’s hometown and family. Only a great man would make so many people make their way out in the raging snowstorm to say thank you for being my friend. In the week since the news of Peter’s departure, getting Julia to school has gotten easier. I try harder to just go with the moment. Like Improv. Julia’s coat went this morning, in the apartment, no problem. ” Can take my toy to school?” Julia asked softly, trying not to set off the trip wire of “no”. Turning west, the wind really picked up. And Mommy did. She did not look at her cell to check the time. She did not think of other moms who shepherded their toddlers to school with less drama, and fewer tears, ahead of them on the streets of New York City. 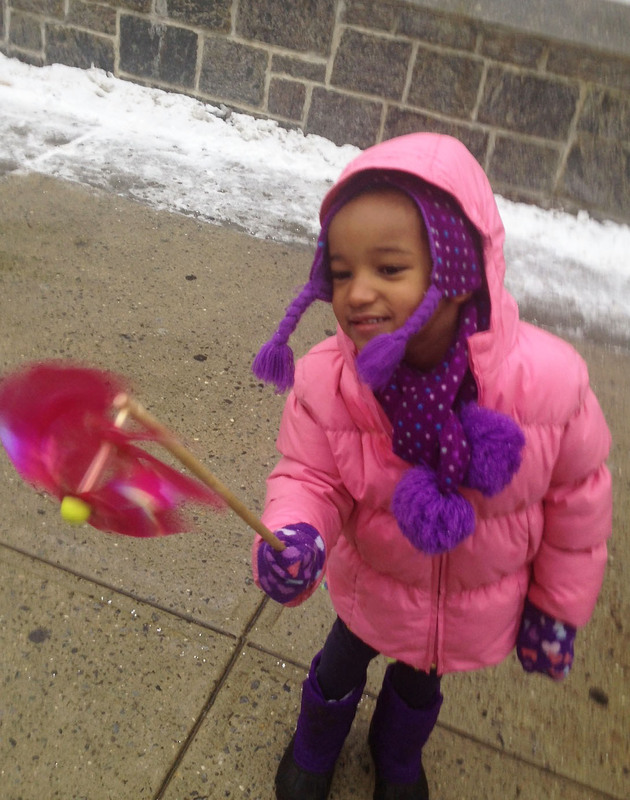 I looked at the pink pinwheel whirling in my daughter’s hand, and I silently gave thanks, thanks that I have a daughter to see, and wisdom to take the time to enjoy the view. from Charles Blow of The New York Times.